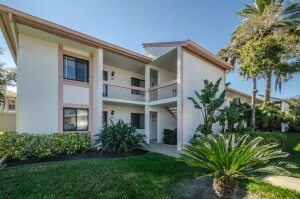 55+ Community Condo With FABULOUS WATER VIEWS! 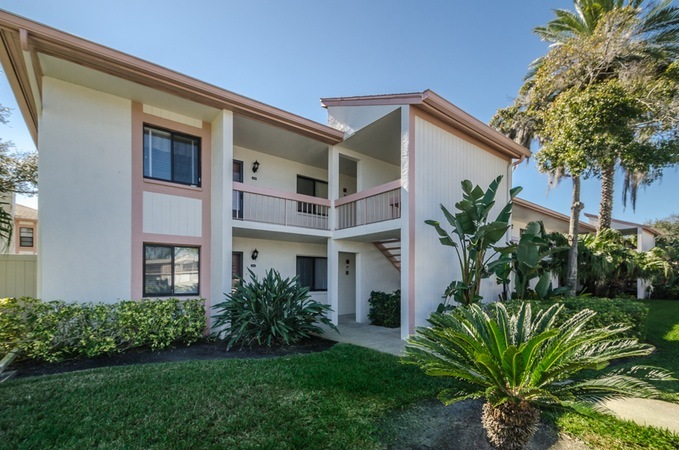 This tranquil lakefront condo offers the quality you would expect from an amenity-rich, 55+ community in beautiful New Port Richey. Outside, the charming patio is framed by lush grass & the most spectacular view of the lake. Inside, this vista of sea & sky is visible from just about every room in the home, infusing the Florida lifestyle throughout. Tile floors in every room enlarge the space by integrating them & provide carefree maintenance along with the versatility to change your décor on a whim by simply dressing the rooms with areas rugs to suit your unique style. The open floor plan adds even more dimension; the living room/dining room flow right into the windowed family room revealing panoramic water views. Sunlight shines into both immaculate bedrooms, while the single bath is updated & outfitted in gleaming white tiles. The newer kitchen is sublime, with its fresh, white cabinetry, contrasting solid surface counters, warmly glowing backsplash, eat-in area, glass top stove, & a pass-through to the dining room. The concealed laundry room is adjacent to the family room; the A/C was replaced in 2012. HOA fees are $410/month & include water/sewer/trash pick-up/basic cable/ground maintenance/escrow reserves/insurance on exterior building. From your covered car port it’s just a stroll down the street to the heated pool edged in rich pavers & nestled on the lake. The clubhouse has it all from a kitchen to a Great Room & a regulation size pool table; plus shuffleboard courts, & the ultimate fishing pier. https://trinityeastlakerealestate.com/wp-content/uploads/2018/03/LC-WebLogo-340x156-300x138.png 0 0 loricrawford https://trinityeastlakerealestate.com/wp-content/uploads/2018/03/LC-WebLogo-340x156-300x138.png loricrawford2015-01-31 18:58:092015-01-31 18:58:0955+ Community Condo With FABULOUS WATER VIEWS! East Lake Woodlands Corner Unit Condo! The popular East Lake Woodlands Country Club Community is home to this sunny & spacious 2 bed/2 bath residence. 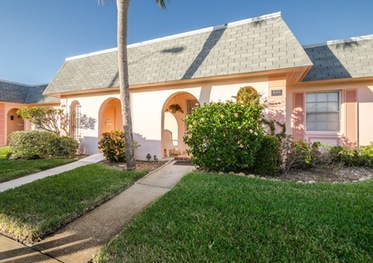 Location, location, location – for one of the finest neighborhoods the Tampa Bay area has to offer, consider this rare opportunity to own an end unit in a sought after subdivision. Cozy up to shimmering pond views from just about every room in a nuanced setting. In keeping with more contemporary floorplans, the living room & dining room are open & airy, made homey by the wood burning fireplace, its oversized façade & decorative mantle. Sliders to the screened sun room reveal a lovely lake & landscaped views. Hunter Douglas Luminette blinds grace the windows. A large pass-through from the dining room offers easy access to the updated, eat-in kitchen outfitted with decorative cabinetry, softly luminous paint, newer tile flooring, & the perfect breakfast corner to enjoy casual meals. The second bath is completely updated with modern finishes including a sleek, apron farm sink & gleaming vanity. In the master bedroom suite, enjoy the absolute luxury of 3 walk-in closets, as well as an almost complete facelift of the bath which showcases dual vanities, plenty of storage & a separate room for the commode. The heated community pool is steps away. Monthly fees cover: basic cable, covered carport, grounds, roof, trash, water/sewer/bldg exterior. With close proximity to area airports, attractions, fresh water lake, excellent dining & shopping; you’ll find your new home on the sunny side of this street. https://trinityeastlakerealestate.com/wp-content/uploads/2018/03/LC-WebLogo-340x156-300x138.png 0 0 loricrawford https://trinityeastlakerealestate.com/wp-content/uploads/2018/03/LC-WebLogo-340x156-300x138.png loricrawford2015-01-31 18:42:522015-01-31 18:54:30East Lake Woodlands Corner Unit Condo!